RawTherapee RAW image editor released version 5.5 last night with exciting new features. Here’s how to install it in Ubuntu 18.10, Ubuntu 18.04. Filter to remove striping artifacts and banding artifacts for any camera has a PDAF entry in camconst.json. Unbounded processing – allows you to decide whether out-of-gamut colors should get clipped. Contrast threshold mask which divides an image into areas of high and low detail, allowing the effect of certain tools (Sharpening, Post-Resize Sharpening, Microcontrast, Demosaicing) to be focused where it matters most and to mitigate the effect on areas where it would be undesirable. New Soft Light tool which enhances contrast and saturation by emulating the effect of blending an image with a copy of itself in “soft light” blending mode in GIMP. New icon and cursor theme. New cameras support, and new input color profiles. Other new features, enhancements, and bug fixes. Go to file’s properties, allow executable file as program, and finally run it to launch RawTherapee 5.5. There are also a few PPA repositories that contain RawTherapee packages for Ubuntu. I’ll update the tutorial once the 5.5 release package is available. 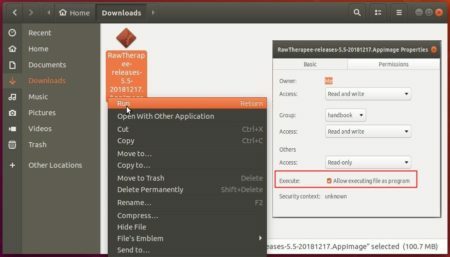 UPDATE: For Ubuntu 18.04, Ubuntu 18.10, Linux Mint 19.x, you can install RawTherapee 5.5 via the unofficial PPA. Input your password (no asterisks feedback when typing) when it prompts and hit Enter to add the PPA. 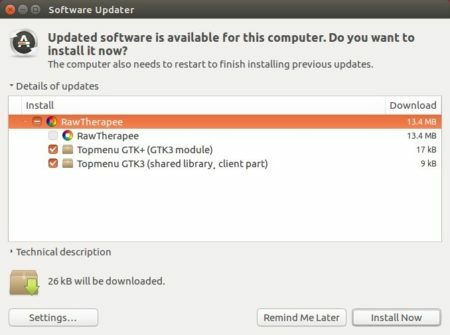 The upgrading process may be kept back if you were installing it from Ubuntu Software. And remove the PPA via Software & Updates utility under Other Software tab, by removing the line says “http://ppa.launchpad.net/dhor/myway/ubuntu”. With your advice, Rawtherapee 5.5 command line installation fast and efficient.